UNITED NATIONS, July 31 -- The day after the UN's Capital Master Plan sealed off an area in front of the Security Council balcony with red "Asbestos" tape and then afterwards quickly declared the area safe, CMP chief Michael Adlerstein barred the Press from a "Town Hall" meeting about the plan and safety. 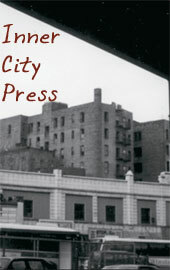 Adlerstein, when Inner City Press was previously blocked from covering such a meeting, promised to allow entry in the future. But on July 31 he shrugged and his spokesman argued that the offer had been only for the next meeting, and that the presence of the Press would change the discussion. Inner City Press has been provided with several blow by blow accounts of the meeting. 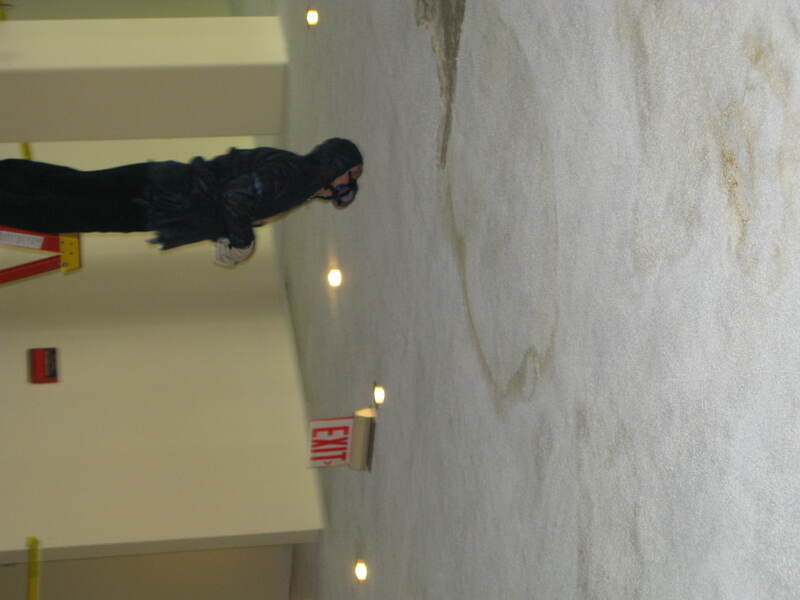 The fallen ceiling and testing for asbestos was raised. But another controversy, which perhaps explains Adlerstein's desire for secrecy, was an incident discussed in which concrete hit a workman on the UN construction site in the head. This was written up as a violation, along with the UN's general contractor Skanska blocking access to the Siamese connection carried water to put out fires. Adlerstein told concerned UN staff that Skanska is appealing. The staff, at least as sampled by Inner City Press, were not convinced. Adlerstein was asked to put on the UN's web site all information about violations. He said he would check with the Office of Legal Affairs. Given his exclusion of the press and public from his "Town Hall" meetings, Internet posting of safety violations seems unlikely. Adlerstein was also grilled about bad conditions in the UN's "swing space" in the Albano Building on 46th Street. Russian staffers of the Department of General Services and Conference Management complained of freezing air being thrust upon them from badly designed vents directly above their workplaces. Inner City Press was invited and confirmed this, as well as the lack of air conditioning at the Arabic DGACM unit lower down in the Albano Building. One wag jokes that this was a form of profiling, and that the Arabic group, if and when the UN compound is finally fixed, are not assured of a right of return. The UN's messengers' unit, meanwhile, says it is forced to work in cramped quarters with the whole Albano unit using a single toilet, and without access to the various floors of the Albano Building which they need to visit or service. Inner City Press' invited visit reveals some floors with fire doors blocked or taped open, others sealed up tight. 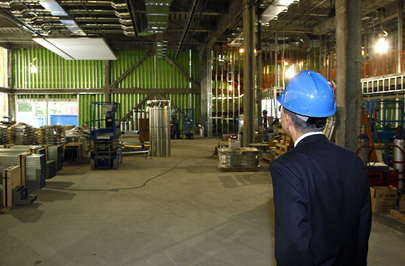 Some complained that when Secretary General Ban Ki-moon visited this week, he went to only two floors. The issues raised at Friday's closed door meeting and below, these staffers say, are not understood or taken seriously by Ban Ki-moon. A recurring complaint was the lack of sound proofing cutting into the ability top work. This is a theme with Adlerstein, who along with Department of Management chief Angela Kane is insisting on changing a previously commitment to the UN correspondents that their "swing space" would be similar to what they have, with the ability to make phone calls and, in the case of investigative journalism endeavors like Inner City Press, to meet confidentially with whistleblowers. Now Adlerstein, Kane and Ban's advisors have decreed that walls will be only seven feet tall, and paper thin at that. In an attempt to divide and conquer, wire services will be able to request taller walls after a week, while other media like Inner City Press and the Washington Post -- which is mulling closing its long time UN bureau, as Inner City Press exclusively reported, as picked up by the Daily Beast -- can only make such a request after four months in a "Whistleblower Free Zone." Inner City Press' visit on July 30 -- after a demand to delete a photograph of the police taped "Asbestos" zone on the floor -- to Adlerstein's office in the basement under the library found that he has full floor to ceiling walls, hard and sound proof. Secrecy reigns at the UN, with safety and sanity seeming to take a back seat. Watch this site. 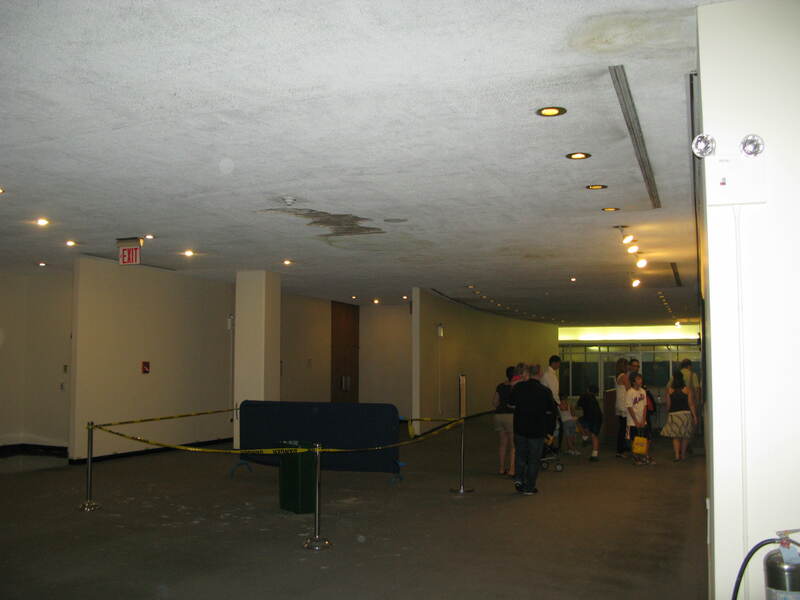 UNITED NATIONS, July 30 -- For days on the UN's third floor a patch of fallen ceiling has been roped off with yellow police tape. Still, on July 29 Inner City Press witnessed families with strollers walking feet away from the police tape, touring the UN. On July 30, seeing a workman with what appeared to be a gas mask on probing at the ceiling with standing on a ladder, Inner City Press took a photograph. An official of the UN Capital Master Plan rushed over to Inner City Press and asked why the photograph was taken. The safety measures used by the UN workman, under a ceiling hole by while unprotected visitors and children passed only a day earlier, seemed of potential news value. The official went back over to the roped off area and returned with the workman. "You have to delete the picture," the workman said. "You took it without my permission." He grabbed for the camera. Inner City Press pulled back and explained that since the UN is a public institution, the work done with public money, in an area with even outside visitors were permitted less then 24 hours earlier, the photograph would not be deleted. The workman retorted that he is not a UN employee but rather a contractor. (Click here for Inner City Press' previous exclusive story about the UN's asbestos contractor, ATC Associates which has been hit for Clean Air Act violations). The Capital Master Plan official escorted Inner City Press down to the office of the CMP in the basement of the UN's library, to speak with CMP director Michael Adlerstein. In front of his ample office with its views of the East River, a receptionist asked, Is this about up there, the third floor? It's related, the official said. Another receptionist said Mr. Adlerstein is in a meeting, Mr. Adlerstein can't be bothered. 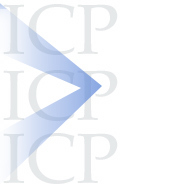 Inner City Press left a business card, if any legal reason for deleting such a photo existed. Later on Thursday, to the yellow police tape around the work area, now with what appeared to be air testing machines buzzing, was added an additional red emergency tape with the word "ASBESTOS." The context here is that the City of New York has already barred school children from being taken on tours of the UN"s Conference Building, including the third floor area at issue. It is not clear why children, including in strollers, still passed by the fallen ceiling on July 29. The CMP's many assurances that all asbestos work is being done in a safe manner appear to be called into question by the amateur and ad hoc fashion that the fallen ceiling on the third floor has been handled. Adlerstein is slated to give a "Town Hall meeting" for UN Staff on July 31. After his spokesman excluded Inner City Press from a prior such meeting, Adlerstein told Inner City Press is can attempt future Town Hall meetings. Watch this site. UNITED NATIONS, May 28 -- At the UN, asbestos removal has begun in Headquarters library, with doors unsealed between the asbestos and where UN staff are working. While experts tell Inner City Press these conditions would not be accepted anywhere else in New York, or the United States, since the UN is international territory, the proximity of asbestos and unprotected workers has taken place this week. In a closed door meeting with UN interpreters concerned about conditions, the UN's and its contractors' defense is that workers are protected by "negative pressure." 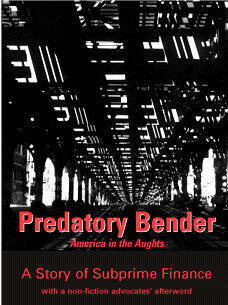 Some predict a boomerang-ing of this negative pressure against the asbestos removal. It is part of the UN's Capital Master Plan, whose director Michael Adlerstein reported met last week with UN interpreters who are worried about working in the Security Council once the rest of the building is emptied out and the asbestos work is going on. The UN's asbestos contractor, ATC Associates which, as Inner City Press exclusively reported, has been hit for Clean Air Act violations, sent a representative named Roney Rivero to the meeting, who is reported to have said there is no link between asbestos and cancer, while speaking of negative pressure. One interpreter who works in the Security Council, speaking on condition of anonymity due to fear of UN retaliation, predicted that while for now UN staff are subjected to asbestos, when it becomes clear to the member states' Permanent Representatives who serve on the Security Council, especially the Permanent Five, how the abatement and removal are being done, "there will be big changes. Even though we're there more than the Perm Reps, they're more sensitive, you know." 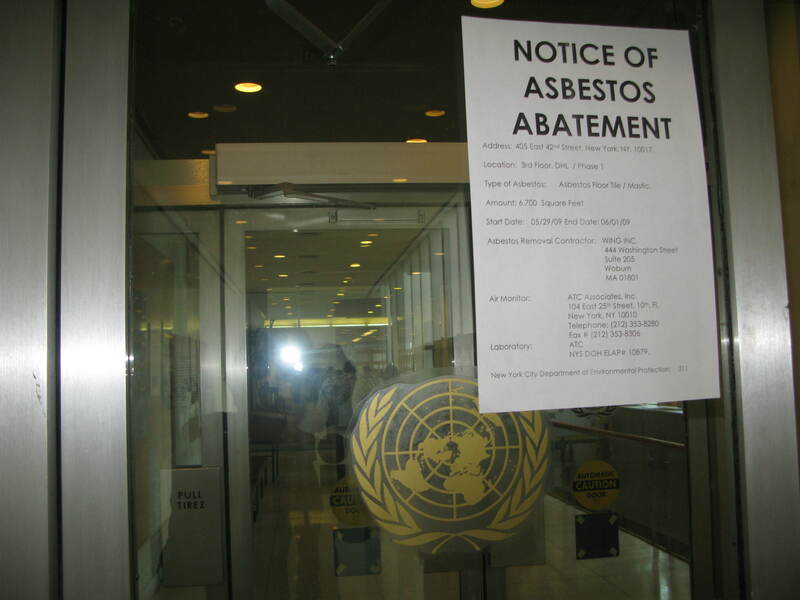 Meanwhile in the UN Library, where staff continues to work, asbestos removal has been done on the first and second floors, where the UN Staff Union complains that the abatement equipment remains stored, and where, they say, there is a film of dust on many surfaces. Asbestos work is slated for the third floor of the library this coming weekend. At the UN's noon briefing on May 28, Inner City Press asked Deputy Spokesperson Marie Okabe for the UN's response to its staff's concern about safety. Ms. Okabe said that Adlerstein and the UN have "every confidence" in those doing the work, despite the asbestos litigation against both ATC and general contractor Skanska. She said Adlerstein would hold a Town Hall meeting with staff on May 29. Video here, from Minute 15:33. At his last "Town Hall" meeting, Adlerstein's spokesman had Inner City Press removed from the meeting, saying it was closed to Press coverage. After the meeting was over, Adlerstein said that the next Town Hall, Inner City Press could attend. We'll see. Earlier, CMP's Adlerstein had claimed that asbestos related charges against the UN's general contractor, Skanska, has all been dropped. Later he conceded that a civil case remains ongoing against Skanska, from alleged deficiencies in asbestos work on a courthouse in California. Adlerstein also acknowledged that people injured by asbestos or Skanska will not be able to sue in U.S. court, but only to arbitrate. Could that explain the lax practices exhibited in the UN library this week?